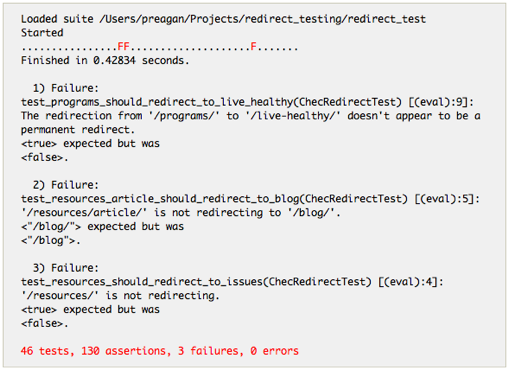 I've generated redirects in Apache using mod_rewrite so many times, I can do it in my sleep. Unfortunately, I think I have done them in my sleep. The result? Time wasted chasing down unexpected application behavior and the wrath of the Viget development team. When a recent re-launch brought with it a change to the Information Architecture of the site, I was determined not to repeat the mistakes of the past. Though this site isn't a Rails application, I wanted to use familiar tools to automate the verification of the rewrite rules I was about to create. In thinking about this a bit more, it was clearly a "behavior-driven" approach - I was specifying the behavior of the web server before its implementation. I had two goals in mind with this approach: clarity and readability. To see how well I did, I shared the collection of tests I created with Kara to ensure that the redirects they represented were accurate. Within minutes, she had corrected a couple of errors I had introduced. My test suite was now complete. The behavior stays the same, but our rewrite rules are now easier to understand (as far as mod_rewrite rules go).